The Daily News on Sunday ran a story about the gates recently installed at some Metro rail stations and TAP cards and now several media outlets are showing some interest. The gist of the Daily News’ story was that Metro spent $46 million on the gates and $154 million to date on the gates and TAP card system — but the gates aren’t yet locked. In other words, that’s a lot of money to spend on something that isn’t being used as intended. As we explained in May in a lengthy post answering reader questions about TAP cards, the gates aren’t yet locked because Metro is still using paper tickets, although plans are to do away with them in the future. •The Board of Directors of Metro recently approved a contract to purchase paper TAP cards that will be sold at ticket vending machines and will work with the gates. The paper TAP cards will also be sold by some employers who sell their workers Metro passes. That should help reduce the need for paper tickets. •At least one ticket machine at each rail station is being reworked to sell the plastic (the more durable) version of TAP cards. It will be a good option for those who don’t want to buy a TAP card by phone or over the internet. •About $16 million of the cost of the gates was paid for with a 2008 grant from the state transportation bond (known as “1B”) to enhance security at stations. About $70 million of the $154 million was spent on retrofitting buses with TAP equipment. •My own two cents on this: I’m not a fan of the current “proof of payment” system or, as it’s often called, the honor system. I don’t think it’s fair to paying customers — even if fare evasion is estimated to be low — and I certainly don’t think it makes sense going forward as the Metro Rail system expands and stations are inundated with many more passengers. Most other large cities had long had gates or turnstiles and were able to convert them to smart cards; Metro is doing it from the ground up. •As for criticism of TAP cards’ role in this, I suspect that will subside when more fare products are finally available on the cards — specifically day passes and the “cash purse” coveted (rightly so) by many of our readers. Metro officials have told us that they are working on it, but it’s not done yet. •Even with TAP cards not fully implemented, there are about 15 million transactions a month with them. Chucking Metro’s TAP smart card fare program as some critics suggest is like throwing the baby out with the bath water. TAP is working as evidenced by more than 15 million transactions a month. Customers like it because they can load their cards online, replace their fare value if they lose their cards, it speeds boardings and, eventually, will lead to seamless travel on a multitude of transit carriers in LA County. 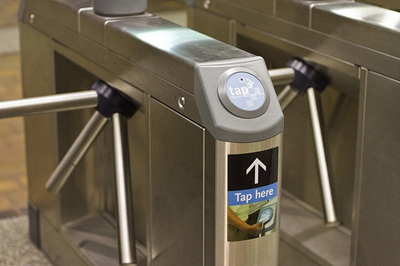 Ridership data yielded by TAP is helping Metro better tailor service to meet demand, and the gated rail stations – only a small part of the TAP program – already has enhanced security and reduced fare evasion even if the gates aren’t yet locked. Incidentally, the gate installation was only completed one month ago.